In 2008 verscheen bij The American University in Cairo Press het boek ‘The Red land, the Illustrated Archaeology of Egypt’s Eastern Desert’, geschreven door Steven E. Sidebotham, Hendrikje M. Nouwens en Martin Hense, die ook verantwoordelijk was voor de illustraties. For thousands of years Egypt has crowded the Nile Valley and Delta. The Eastern Desert, however, has also played a crucial –though until now little understood- role in Egyptian history. Ancient inhabitants of the Nile Valley feared the desert, which they referred to as the Red Land, and were reluctant to venture there, yet they exploited the extensive mineral wealth of this region. They also profited from the valuable wares conveyed across the desert between the Nile and the Red Sea ports, which originated from Arabia, Africa, India, and elsewhere in the east. 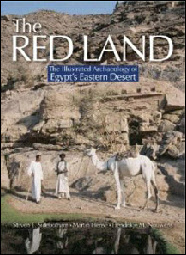 Based on twenty years of archaeological fieldwork conducted in the Eastern Desert, The Red Land reveals the cultural and historical richness of this little known and seldom visited area of Egypt. A range of important archaeological sites dating from Prehistoric to Byzantine times is explored here in text and illustrations. Among these ancient treasures are petroglyphs, cemeteries, fortified wells, gold and emerald mines, hard stone quarries, roads, forts, ports, and temples. With over 280 photographs and fascinating artistic reconstructions based on the evidence on the ground, along with the latest research and accounts from ancient sources and modern travellers, the authors lead the reader into the remotest corners of the hauntingly beautiful Eastern Desert to discover the full story of the area’s human history.